Because anything can happen when the waters are uncharted. I wish I wrote often enough or intimately enough on this blog to express how radical the curve balls that life can throw you can be. 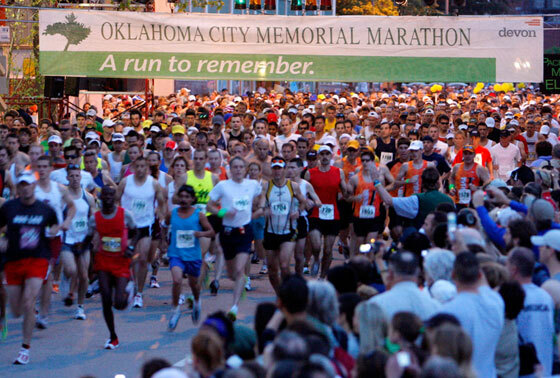 Exactly one year ago, embarking into 2010, I would never have suspected that I would be making the commitment I make today: I will run the Oklahoma City Memorial Marathon, on May 1, 2011. Over the past year, I have pushed myself into better physical shape. Recently, I have hit a bit of a wall and recognized the need to recommit myself. Thanks to this realization and the advice and encouragement of good friends, I decided that seriously engaging myself in the training and preparation needed to run a full 26.2 miles would, at the very least, provide a shock to the system, hopefully for the better. I begin training this Monday, bringing to it what progress I have made in reshaping myself over the past year. If I succeed here, I can promise I’ll be far closer to my personal fitness goal than I’d have previously imagined. We are going to rock this thing. Woo!